Nowadays the usual suspects are busily peddling the idea that Hurricane Florence’s intensity is due to climate change. The German media and climate science establishment are out in full force implying recent hurricanes are mostly manmade and getting stronger and more frequent. However, just as Kenneth Richard showed yesterday by presenting more than a dozen recent papers, when we look at the observed data, all these alarmist claims go down in flames. Although some people may think Florence is a major hurricane, it in fact made landfall as a Category 1 storm only – a far cry from the Category 4 many were warning us about just days ago — e.g. Erik Holthaus. 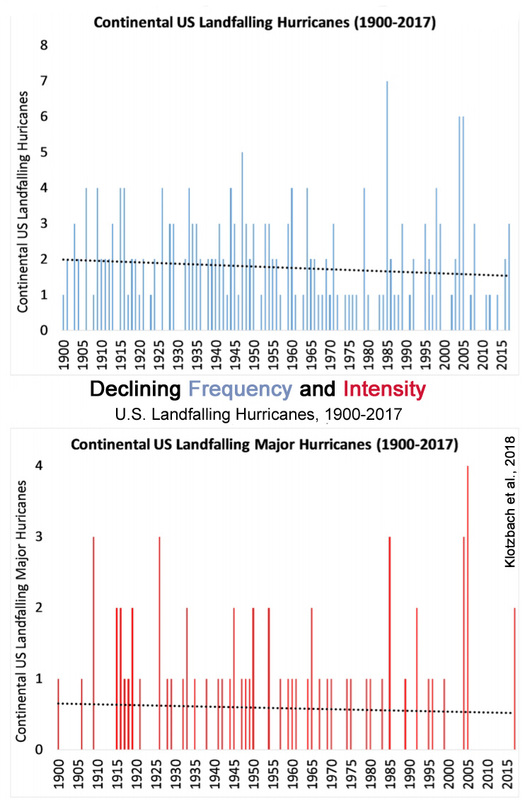 What is unprecedented is the long 12-year period from 2005 to 2017 which saw not a single major hurricane hitting the US. This is probably the most devastating and frustrating fact for the global warming ambulance chasers. That’s a glaring statistic that’s impossible to alter. 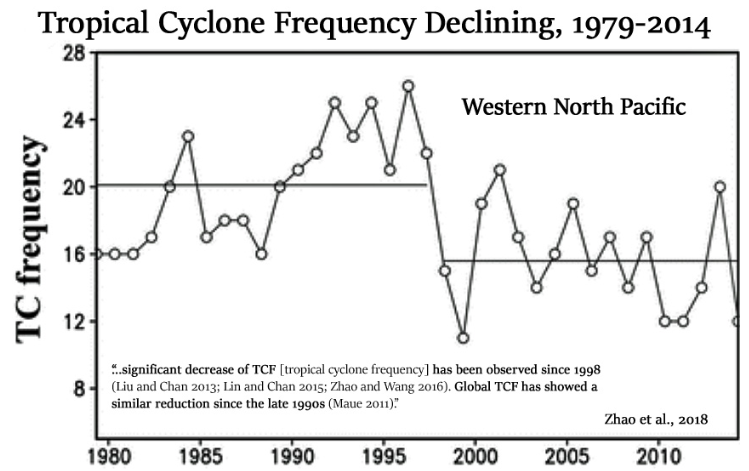 The story is much the same in the North Western Pacific, where the following chart shows us cyclone frequency has been much lower over the past two decades compared to the two decades prior. 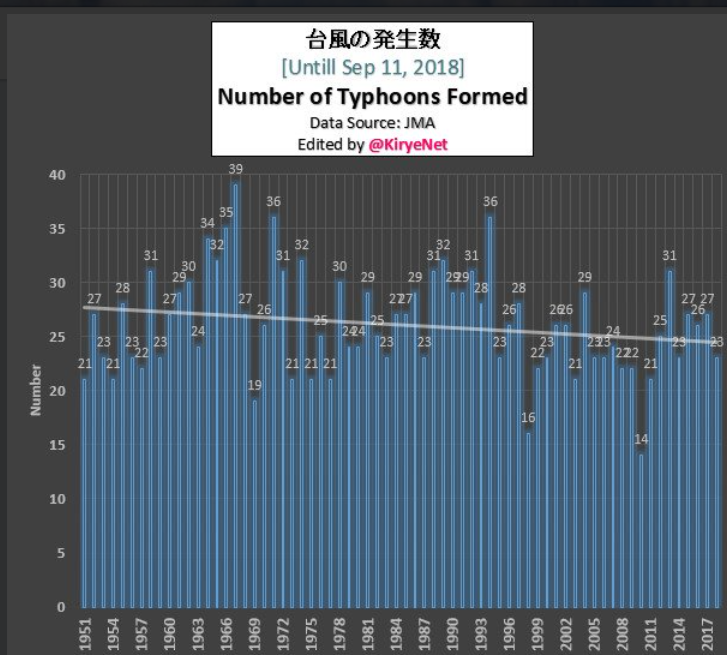 Number of typhoons on the decline. Source: Kirye. Is there any alarmist claim that ISN’T demolished by Real Observed Data? … Or the total lack of any supporting scientific data. Late in the evening on August 17 in 1969, Hurricane Camille made landfall along the Mississippi Gulf Coast near Waveland. Camille is one of only THREE Category 5 hurricanes ever to make landfall in the United States, the other two being the 1935 Labor Day Hurricane in the Florida Keys and Hurricane Andrew, which hit the Miami, FL area in 1992. Camille also ranks as the 2nd most intense hurricane (ranked by pressure) to strike the continental US with the 2 hurricanes listed above ranked 1 and 3, respectively. The actual maximum sustained winds are not known, as the hurricane destroyed all the wind-recording instruments in the landfall area. Re-analysis data showed peak winds of 175mph along the coast. A devastating storm tide of 24.6 feet occurred west of our area in Pass Christian, MS.
Activity of Atlantic increased as a result of increased solar wind activity (geomagnetic storms). Geomagnetic activity increased already in August 2018. Another strong jump in the speed of the solar wind. The jet stream in the Atlantic will now push Florence to the west. Similarly, the typhoon in the Pacific is heading west towards China. seb shows ZERO comprehension, yet again..
We leave the false claims to you. From my several years of observation, it appears that when the speed of the solar wind increases (geomagnetic activity) over a period of about a month, the speed of the jet stream over the North Atlantic and Pacific increases, which is conducive to the formation of hurricanes in the tropics. Circulation on the ocean then takes the shape of an ellipse.